Located in the Historic Eastside on Acequia Madre Street, this lovely two bedroom, two bath home features a wood burning kiva fireplace in the large living area and Direct TV in the living and bedroom areas. Guests can enjoy gourmet meals prepared in the fully equipped kitchen or relax while grilling on the professionally landscaped patio garden. The master bedroom features a king size bed, ample closet space and a small sitting area adjacent to a decorative kiva fireplace, as well as an en-suite bathroom. The bathroom has a Jacuzzi tub, separate shower, and two dressing areas. The guest bedroom offers a king size bed that can be converted to twin beds as an alternative. It also has an en-suite bathroom, generous closet space, and a decorative kiva fireplace. 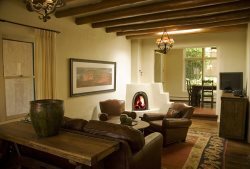 Conveniently located near Canyon Road and the Plaza, this is the ideal casita for enjoying the essence of casual Santa Fe living. Should you need to rent for a larger group, Casas de Santa Fe manages other units in the Acequia Compound: Casa Segunda and Casa de Madre. Flat Screen TVs with DirecTV are in the Living Room and both Bedrooms. You have a very good group. Way to go Lynn and Todd. Please don't price 442 out of consideration. The Casas de Santa Fe team was great to work with on our trip. Thank you for all your help! This is a great company that the owners and staff are dedicated to the satisfaction of their customers.